It is certainly not the first time I'm making a mosaic with work from this artist. His work is so unbelievable inspiring and fun. 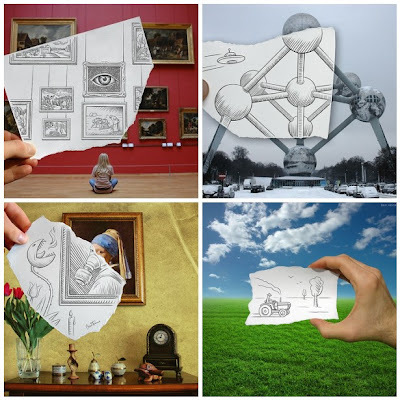 He is the inventor of 'pencil versus camera' and replaces part of the picture with a drawing or reverse. How refreshing! I love how his imagination takes over. Just look at the 'girl with the pearl earring' from Vermeer - the gasmasque is just so surreal. I can't believe I didn't follow his stream yet! Check! Next week is a themed mosaic week. So if you care to play by theme take your favorite happy and built your mosaic around it.